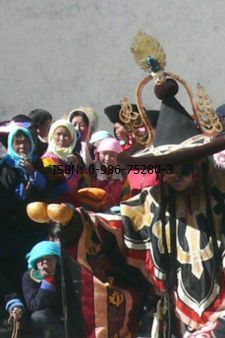 Throughout the conduct of the Cham, the dancers circle clockwise in time with the music, and sometimes quietly chant to themselves, as they ensure the edges of the dance area remain sealed so that evil spirits cannot escape. During the dance, various objects are carried in the right and left hands of the dancers, as seen in photographs elsewhere in this script. These hand-carried implements are called Ritual Icons. Some ritual icons are not hand-carried but are rather carried in the crook of the elbow or across the body supported by the bent forearm and elbow. The ritual icons are also found in the iconography of tangka paintings. 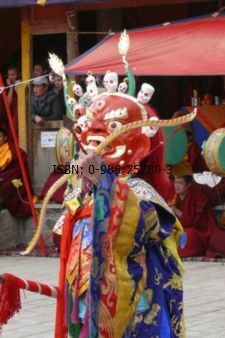 These items are major clues when identifying the character portrayed by the dancers, and determining the difference between the various and similar forms of Mahakala, Palden Lhamo, or others and the manifold assistants and acolytes that they each have. Ritual Icons is the name given to the 'implements' that are used by the dancers during the Cham. This is to differentiate them from the 'instruments' used by the main actors in the dance (Yama, Ksetrapala, Shanag Master) in the final destructive moments of the dance. Many of the instruments used have their origins as battlefield weapons or in the horrific areas of cemeteries. These instruments of terror, slaughter, destruction and sacrifice were taken from the hands and the arsenals of the enemies of Buddhism and turned against them. In the hands of the wrathful protectors they become transformative weapons and symbols of wrathful compassion to destroy the illusions of the human ego, and overcome greed, ignorance, jealousy, hatred and pride. 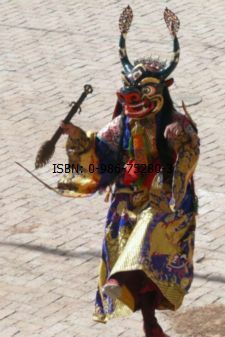 The instruments used by main dancers such as the Shanag Master, Yama or Ksetrapala to ensnare, kill and destroy evil emanations are called Table Tools. 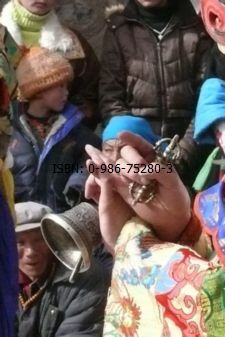 These table tools are used and exchanged during the dance as determined by Rol Pon and the assistant to Dorje Lopon. We shall first examine the implements or Ritual Icons carried by Cham dancers. Subsequently we will examine the instruments or Table Tools used in the final destructive moments of the Cham dance. 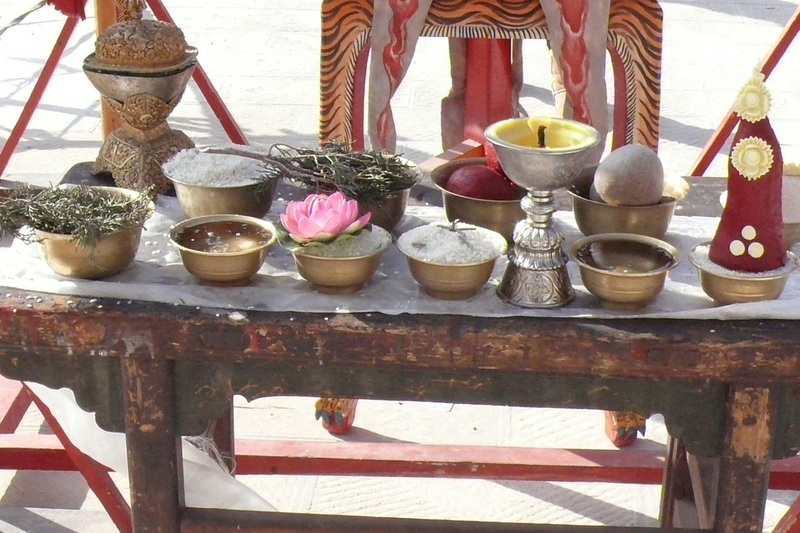 The following ritual icons or implements are carried and used by the various Cham dancers in the course of the dance to appeal to and appease the Wrathful Deities, while also ensnaring and capturing evil emanations. The primary item carried in the right hand of Yama. Originally it was thought to be the mummified corpse of a baby, but it has evolved into a short club with a small skull surmounted at the top. The skeleton body may be visible or covered by a cloth. Not carried by other dancers. Carried by many deities, normally in the left hand. The noose or lengthy part is wrapped around the hand. What is shown is the clasp which consists of a ring through which is placed the elongated hook (looks like a tantric axe or vajra hatchet). Used in conjunction with the skullcup (thod por), together they cut and dice the organs of miscreants for use by the wrathful protector. 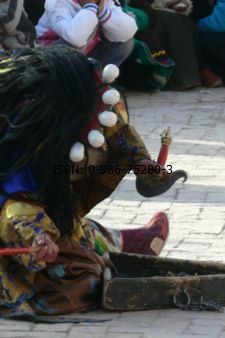 The grig gug is the instrument of choice for Ksetrapala (shown here), and can also be carried by Yama as well as other dance characters. Also called a chopper or flaying knife. As a symbol of wisdom, the sword cuts through the veils of ignorance, severing the knots of illusion that obscure the absolute truth. Shape originally thought to have come from tent pegs used by Tibetan nomads in the high hills. Handle can be topped with a skull (as shown) or a vajra or nothing at all. Sometimes also painted, particularly if crafted out of wood. 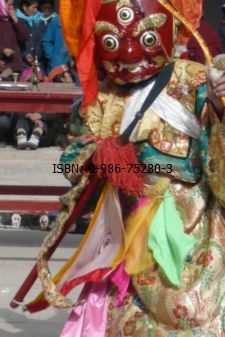 The phurba and the thod pa are the implements normally carried by the Shanag when they dance the Cham. Usually paired with the grig gug which fits the thod pa much like a pestle fits a mortar. Made from the upper part of the cranium. Has higher tantric value if skull from an executed murderer or young child. Item shown is ritualistically filled with blood and human organs. 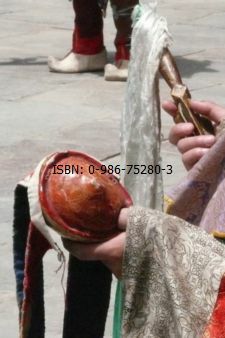 Note thumb-hole for ease of holding; also another style of phurba in the dancer’s right hand. 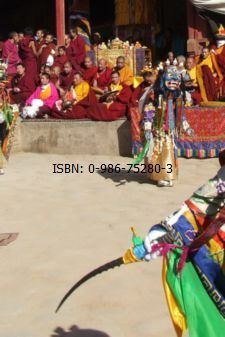 The bow and arrow is the mainstay of Begtse Chen and members of his entourage, as well as other local protectors of the warrior ilk. Adopted from the Tibetan military for the protection of the faith. Below the blue-iron point can be found a yak tail stained red. 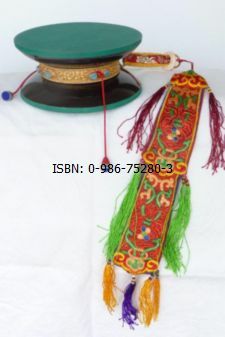 It holds the top of a triangular flag which historically was a Tibetan army military unit pennant. The lance is carried in the right hand, which is the male hand, the hand of method and compassion. Considered more of a Ritual Icon than a musical instrument. A favored implement of Palden Lhamo. Originally made from two joined cranial cavities, covered with stretched skin. Also known as 'fish knives' or 'water knives', chu gri in Tibetan, these implements speak to the aquatic influence of fishermen on Buddhism. 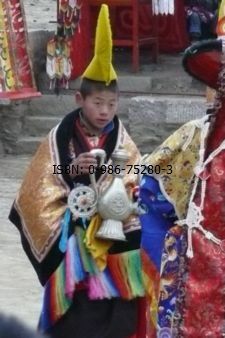 In Amdo, this knife is represented by the horn of a Tibetan Antelope. 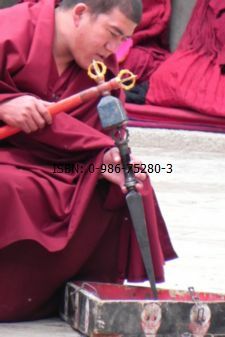 Like most pointed implements, it serves to piece the heart of protagonists in the defense of Tibetan Buddhism. These ritual icons or implements are carried and used by the various Cham dancers in the course of the dance to appeal and appease the Wrathful Deities, while also ensnaring and capturing evil emanations. But the focus of the dance is the destruction of evil. So when negative forces are captured and ensnared in the lingka, specific instruments are used to destroy them. 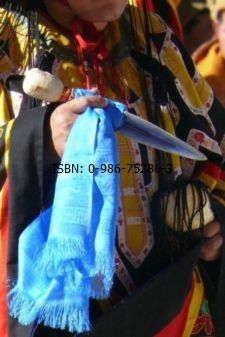 Their usage forms the major part of the second or middle portion of the Cham dance. These instruments will be examined in some detail. 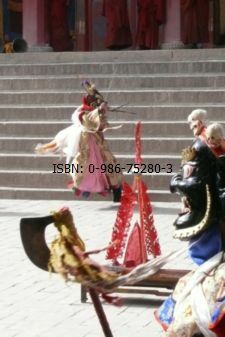 In the final stages of the dance, the main dancer uses various instruments to subdue and destroy the evil spirits. These instruments are called Table Tools and are used by Yama, the Shanag Master and sometimes Ksetrapala to kill and dismember the evil enemies. Items previously shown are not repeated. Table Tools - Instruments at Shachong Monastery. Carried by Ksetrapala in either hand depending on the stage of the dance. The 'hook' can be at the top or bottom of the blade. Vajra and the Bell together symbolize The Way and the Goal (the path to enlightenment). In Buddhist symbolism, Vajra is the male and the Bell is female. This instrument is used to smash and pulverize the bones of the evil spirits so they cannot escape or cause physical harm to the protectors or the practitioners. 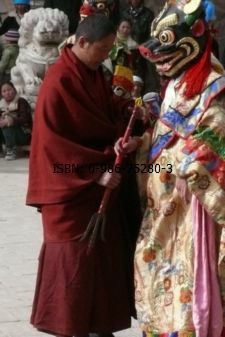 The mace is shown tapping the phurba into the lingka in the dor zhong by the Dorje Lopon assistant. The tantric axe has a military background, coming to the support of Buddhism. It functions to severe the connection between negative thoughts and the mind. As a weapon used by the Wrathful Deities, the three prongs symbolize the three poisons of aggression, ignorance, and desire. The central prong is usually ‘flaming’ which represents the superiority of enlightenment. Also knows as the Flaming Sword of Wisdom, this instrument is similar to the central prong of the trident. Used to pour liquid offerings into cups or bowls carries by dancers. A major part of Shanag chams. These are offerings given to the Wrathful Deities to please them and encourage their cooperation. They also represent the sacrifices made by practitioners to gain the favor of the deity. The origin of these offerings comes from pre-Buddhist or Bon traditions in Tibet, resulting from the earlier arrival of such practices from Indian tantric tradition. The offerings are purely symbolic and only representative of historical blood sacrifices and other extreme rituals. These gifts attract the spirit of the protector deities and Wrathful Ones so that they will come and stay for the duration of the Cham dance. Used to offer food and drink to the ferocious deities. Said to contain warm human blood, warm brain, freshly torn out hearts, and so forth. Offering a double skull-cup, as shown here, is considered very auspicious and special. Made from barley, and chang, and water, and other local ingredients, dorma has many uses. 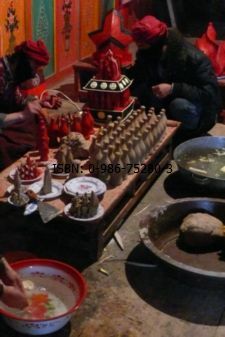 This photo shows mantrins at a Nyingma monastery making various items from dorma. Table tools or dancing instruments come in various sizes and shapes. But in all cases the purpose is clear. 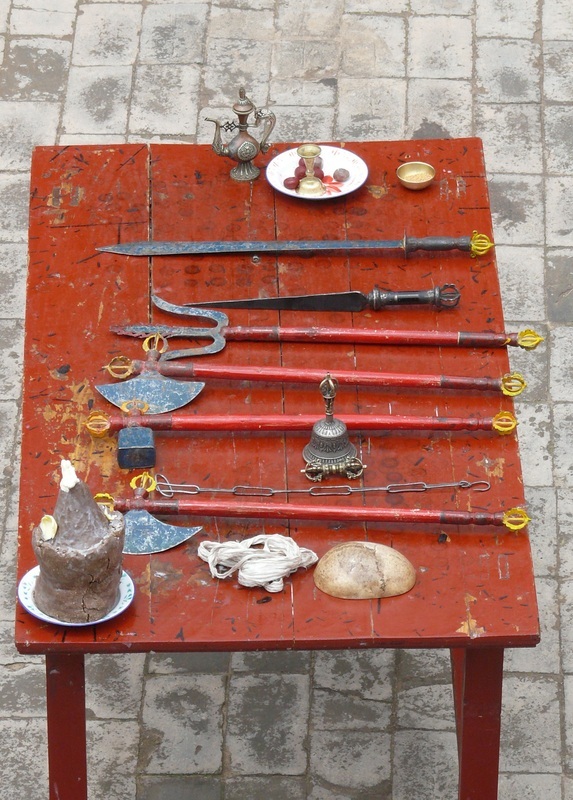 Compare these table tools, from Sengeshong Magotsang (Xia Wutun) with those found at other monasteries. These table tools were found at Sengeshong Yagotsang (Shang Wutun) monastery. ... and of course the Living Buddha, the Abbot, and various Rinpoches will need some refreshment and sustenance during the course of the Cham dance.